Surprisingly fertile growing soil, eclipses in shades of red and green, square craters: Could the Moon get any more amazing? Maybe if its recent past included a series of exploding space volcanoes? 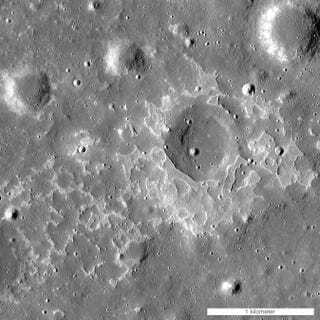 Scientists have long thought that volcanic activity on the Moon came to an abrupt halt over a billion years ago, after a busy volcanic session starting over 3 billion years ago. A new analysis of the surface of the moon, by super robot photographer the Lunar Reconnaissance Orbiter, however, says that the original estimate was off by several hundreds of millions of years. Now, NASA says that, around the time that dinosaurs were ruling the earth, the Moon was a volcanic hotspot, with evidence of volcanoes erupting between 50-100 million years ago. The picture above is just one of the snaps they grabbed of what appear to be young volcanic deposits, a feature which the researchers say could change what we know about internal moon temperatures. The study, which was conducted by researchers from Arizona State University, is published in Nature Geosciences and can be read right here.